Hang Seng Index once rocketed more than 700 pts. As at 2:09 pm, market turnover has reached HK$175.3 billion. As at 2:09 pm, the daily quota (RMB10.5 billion) of Southbound Trading under the Shanghai-Hong Kong Stock Connect has been used up, setting a fresh high for the quota used in a single day. Meanwhile, the remaining balance of Northbound Trading quota was RMB15.814 billion, accounting for 121% of the daily quota, indicating that the turnover of sell orders exceeded that of buy orders. After the five-day long holiday, Hang Seng Index once surged 620 pts to 25,896 this morning, hitting nearly 7-year high, and it closed the morning session at 25,877, up 602 pts or 2.38%. Hang Seng China Enterprises Index bounced 505 pts or 4% to 13,168. Market turnover was as high as $132.276 billion. Hong Kong stock market was bullish this morning. Amid robust trades in Shanghai-Hong Kong Stock Connect, HKEX (00388.HK) rallied 8.7% to $213 at midday, becoming the strongest blue chip for the morning session. Chinese financials led market gainers, with CHINA LIFE (02628.HK) rising 4.7% to $36.6. The four big banks advanced 2.1% to 3.5%. In addition, HAITONG SEC (06837.HK) shot up 14% to $22.8. CITIC SEC (06030.HK) and CHINA CINDA (01359.HK) also elevated 7.5% and 8.6%. TENCENT (00700.HK) rose 1.4% to $151.9. Other dot.com shares also recorded strong gains this morning. NETDRAGON (00777.HK), KINGSOFT (03888.HK), KINGDEE INT'L (00268.HK) and BOYAA (00434.HK) leaped 34%, 19%, 14% and 12% respectively. AIA (01299.HK) hit a new high and surged 2.7% to $50.7. HSBC HOLDINGS (00005) jumped 1.3% to $67.85. CHINA MOBILE (00941.HK) mounted 2% to $104.9. Gaming blue-chips also headed north. SANDS CHINA LTD (01928.HK) and GALAXY ENT (00027.HK) lifted 7.1% and 6.3% to $34.8 and $38.2 respectively. Dont missed the chance to catch the bull again! 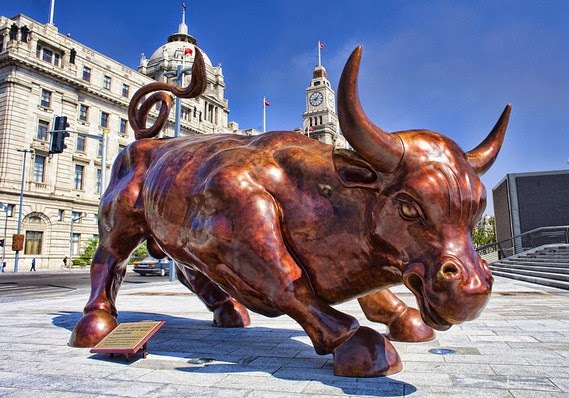 we have been conducting Singapore, Hongkong & China stock seminar since November 2014 Bull Run started. Everyweek Join us every Thursday and Friday stock discussion session!